A Wii U That Is Both Computer And Console. 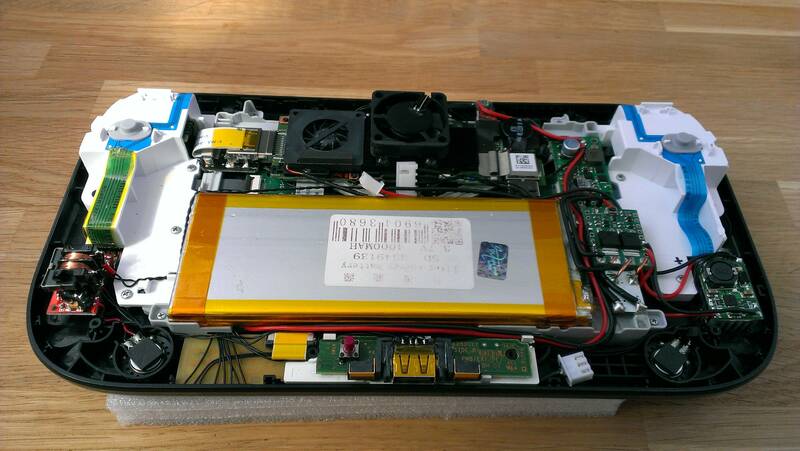 Legendary sudomod forum user [banjokazooie] has once again demonstrated their prowess in Wii U console modification — this time by transforming it into a powerhouse portable computer! We loved [banjokazooie]’s RetroPie Wii U mod, and happy to see them back again with this build. What’s in this thing this time around? Buckle up ’cause it’s a ride: an Intel M5 processor core M on their Compute Stick, 4GBs RAM, a 64GB solid-state drive, a 2K LCD touchscreen, Bluetooth, WiFi, a 128GB SD card slot, two 3.7V 4000 mAh batteries, a Pololu 5V,6A step-down voltage regulator, a Teensy 2.0++ dev board, a battery protection PCB, a USB DAC sound card, stereo amp, a USB hub for everything to plug into, and a TP5100 battery charging board. Check it out! It runs Windows 10 and Cemu — a Wii U emulator — so virtually none of the console’s original functionality is lost in the process! The home button cycles through the joysticks’ coloured LEDs, and battery monitoring software safely shuts it down once the battery reaches critical — which takes about two hours when it’s being put through its paces. The LCD might seem like overkill, but it’s only 2.5mm thick, leaving enough space for the rest of the electronics while also having a more efficient power consumption. Impressive as this is, it’s not the first time we’ve seen a console turned into a computer. So…wait, I’m confused. It looks like a computer turned into a console? Its a computer squashed in to a wiiu gamepad. Its cool but the specs on it arent high enough to run most wiiu stuff at full speed I wouldn’t have thought. Cemu is cool but as with all emulation it requires a decent amount of grunt. Was thinking the same thing the memory won’t hold much either. It has 4 gigs of ram and 64gigs of flash storage. I picked up one of the m3 versions for work and the thing is actually pretty speedy. It needs Vulcan API and capabilities to even run most games at full speed, like yeah, we get it, we can even stream Legend of Zelda from Nintendo Switch straight from a Windows computer with a Nvidia GPU right to our phones with Moonlight and CEmu. Reddit has a lot of (mildly)interesting usernames. I built something incredibly similar a year ago: https://www.instagram.com/p/BLEEePGAD91/?taken-by=specializationisoverrated even sent in a tip. Whoa! It’s beautiful. I am amazed. Have you documented the process? Yes and no, though I’ve been meaning to consolidate everything into one long post. My Instagram had served as a build log.